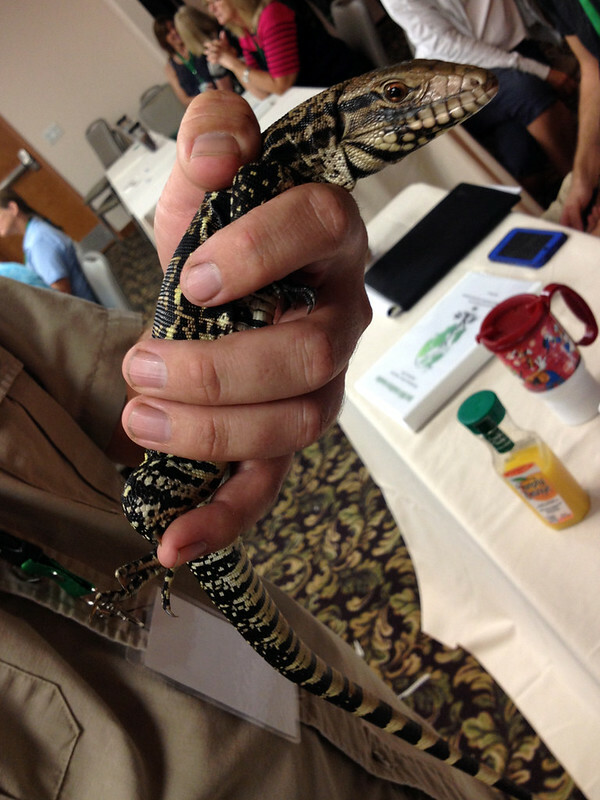 At the end of September I attended the Florida Wildlife Rehabilitators Association annual symposium in Haines City. I was fortunate enough to be granted a partial scholarship and I was happy to be able to attend the full three days of the event. The days were packed with lectures and lessons about rehabilitating all kinds of creatures, with a focus on Florida natives. A group of veterinarians from Canada came to speak as well, so attendees got to hear about some of their special patients as well. 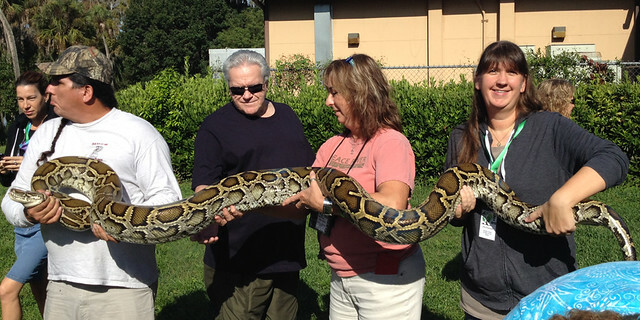 One of the programs I attended was about invasive species, where a few animals were brought for show and tell. 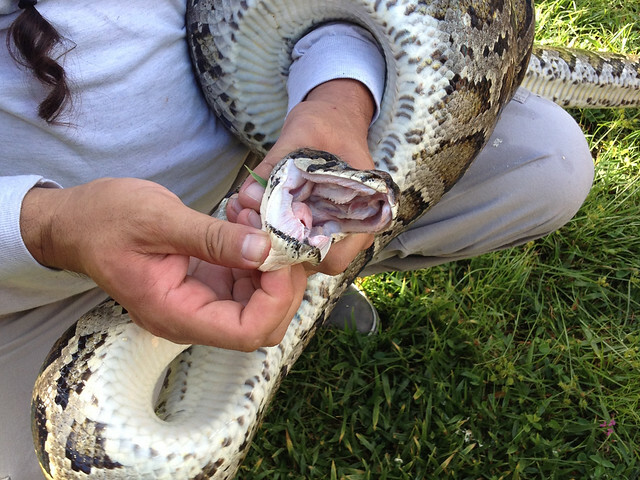 The proper capture and handling of Burmese Pythons was presented, with some fun photo opportunities afterwards. Young Tegu lizard. These invasives are a big problem in Miami-Dade, Collier, and Hillsborough counties. Before the conference, I was a bit concerned that much of the symposium would be over my head, but that wasn’t really the case. The organizers did a great job of presenting different topics that would interest all kinds of skill and experience levels in wildlife rehab. Besides the formal presentations, I really enjoyed getting to know other attendees who work in rehabilitation across the state and beyond. Meal times, plus evening activities like workshops and crafts, left attendees plenty of time to mingle while having creative fun. I made a hawk t-shirt with bleach. 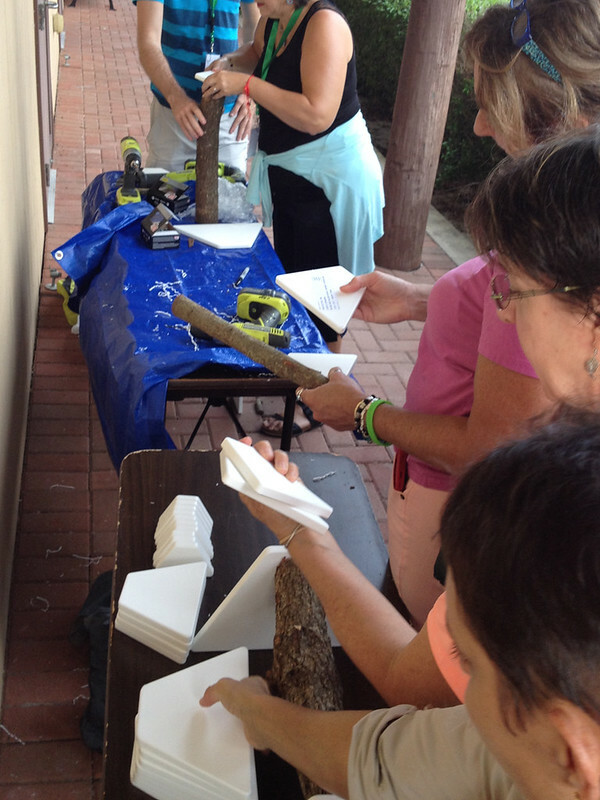 The perch-making workshop was very popular. Being such a newbie when it comes to rehab means that I was able to learn a lot from my fellow symposium participants as well. 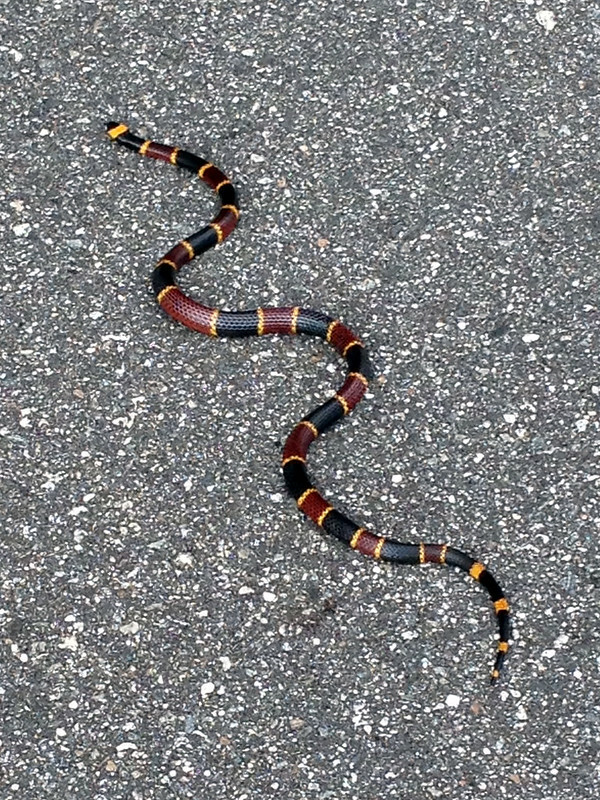 During the symposium I also managed to finally see my most-wanted Florida species in the wild — a Coral Snake! During the before-dinner break on Thursday night I was walking back to my room to freshen up. There were always people walking around the grounds, except for when I stumbled up on this beautiful snake. There was NO ONE to share it with! I was smiling like a total goofball, taking photo after photo of the snake (and maybe talking to it too, maybe). Coral Snakes are one of our venomous species, known to be docile and own-business-minders. So awesome! This entry was posted in Festivals & Events, Florida, Rehabilitation. Bookmark the permalink.